High 5 Megaspin Slot Guide & Review - Casino Answers! The High 5 Megaspin slot is a 3-reel, 1-line megaspin slot machine with wild symbols from Microgaming. With High 5 MegaSpin, you can play up to 9 games at a time. You can play the High 5 Megaspin slot machine at Gaming Club Casino and Nostalgia Casino. To play the High 5 Megaspin slot machine, choose how many slots you wish to play at a time. You can play 4, 6 or 9. If you want to play more slots, game will add more slots onto the screen. Once you’re confident you’ve chosen the right amount, choose a coin value. From there, all you have to do is decide whether you want to play one, two or three coins per spin. There is more value in playing for the maximum bet, so we recommend you set your coin value to accomodate your maximum bet. Then, all you have to is hit the “Spin” button once (not nine times!) and all of the slots on your screen will spin. If a winning combination appears along the center line, you will be credited with a win on that slot. Only the highest win on the center line will pay out. Bets available on the High 5 Megaspin slot machine are $0.10, $0.20, $0.25, $0.50, $1, $2 and $5. The maximum bet on the High 5 Megaspin slot is $135, but you can bet as little as $0.40 on four slot machines. The High 5 Megaspin slot machine has an autoplay feature. Hit the “Expert” button near the left of the screen to switch the game into expert mode. Now your game buttons have changed. You will see buttons for 5X and 10X – these are quick-autoplay buttons so you can play five or ten autoplay spins with the standard game settings. If you wish to use the more advanced autoplay mode, you can hit the “Autoplay” button next to the 5X and 10X autoplay buttons. You will now be able to choose your number of spins (5, 10, 25, 50, 100, 250 or 500), number of seconds between spins (0, 0.5, 1, 1.5 or 2), to stop once all spins are complete, to stop when jackpot is won, to stop if a win exceeds or equals your selected value ($25, $50, $100, $500, $1000, $2500 or $5000), to stop on any win you receive or to stop if your credits increase or decrease by your selected value ($25, $50, $100, $500, $1000, $2500 or $5000). You may stop High 5’s autoplay feature at any time. The High 5s symbol is not only the top jackpot of 15,000X, but it is also a wild symbol. One High 5 symbol in a winning combination with multiply your winning combination 5X. Two High 5 symbols will pay 25X, except when 2 or 3 occur alone on a payline. One High 5 symbol will not substitute for a cherry. It’s quite a rush to play the High 5 Megaspin slot machine. It’s a great slot machine for online casino players who aren’t looking for anything fancy, just a lot of action. Looking for a place to play High 5? You can get 30 free spins along with a 100% up to $100 match bonus on your first deposit at Gaming Club Casino. 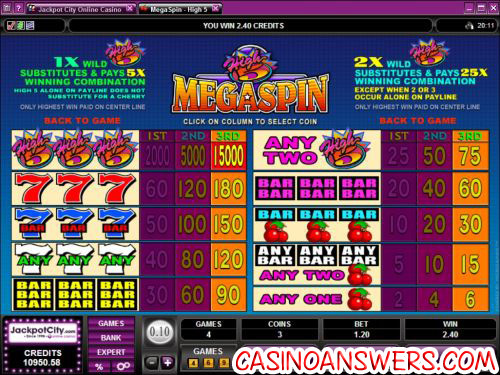 What is a Megaspin slot machine? 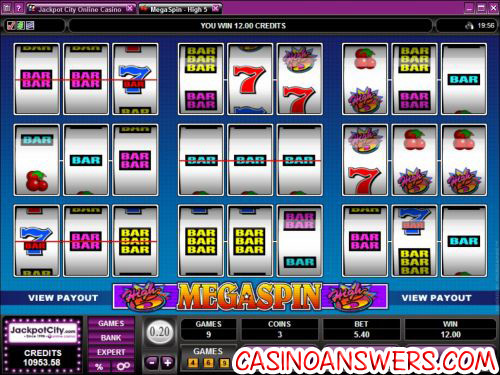 A Megaspin (or multispin) slot machine is an exciting form a slot machine where instead of having one single-line slot machine, you have multiple slot machines going at once. All slot machines play at the same bet levels and are spun simutaneously. Wins on each slot machine are independent from another. Many casino players find that Megaspin slot machines give them a much higher adrenaline rush than your traditional classic slot machines. Does the High 5 Megaspin slot machine have a progressive jackpot? The High 5 game does not have a progressive jackpot. For a Megaspin progressive jackpot slot machine, try playing the Major Millions Megaspin slot machine at Gaming Club Casino. What exciting slot machine games are there? What is a really fun slot machine for a beginner?